so many people love the taste of buffalo sauce, with its combination of tanginess + heat, + never realize how incredibly easy it is to make. you can create your own amazingly delicious buffalo sauce at home with literally only two ingredients — unsalted butter + hot sauce. 1/4 cup hot sauce (the heat of your hot sauce will determine the heat of your buffalo sauce, so choose accordingly – i like louisiana brand or crystal hot sauce). melt butter in a saucepan, then whisk in hot sauce until well blended. serve immediately. yep, that’s it. i told you it was easy! as i said above, the hot sauce you use will determine the heat + flavor in your buffalo sauce, so it’s worth it to spend a bit more money + pick something you love. my favorites are crystal hot sauce or louisiana brand hot sauce, both of which have a nice balance of flavor + heat. when i make a batch of homemade buffalo sauce, i almost always use it to make my buffalo chicken bites. basically, i pull the white meat of a rotisserie chicken into large pieces, flash fry the pieces, then toss them in buffalo sauce. pair these with some celery sticks, blue cheese dressing, + a cold beer, + you’ve got the perfect football-watching snack. enjoy! heat your oil in a large pan until very hot, at least 400 degrees. (you need oil with a high smoke point, because most oils would burn at this heat). dredge chicken pieces in flour, then flash fry in the pan of oil — that is, cook very quickly, almost like stir-frying – about 30 seconds to a minute. transfer chicken to paper towels to remove excess oil, then toss in the hot, freshly-made buffalo sauce. serve immediately. YUM! 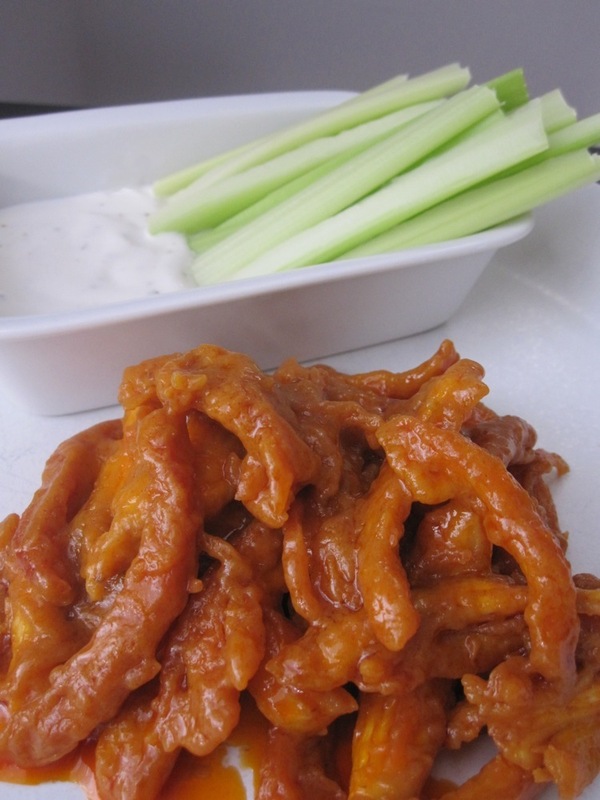 Reminds me a of a recipe for buffalo chicken wing dip that I have. Soo good!